Did you join us for our Nativity Walk or our Easter Walk in Crosby? Well, we thought it was such a great success that we should do it again but this time in Bootle! We have recently moved into a shop unit in the Bootle Strand Shopping Centre and we are really excited to do some performances here. Our unit is located downstairs opposite the ping pong parlour and the walk will start at 12pm on Good Friday (19th April) The walk will start with the last supper in our unit and then the audience will be led out to meet some more of the characters and see the Easter Story unfold in the Strand. 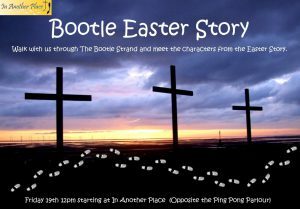 Walk with us through the Bootle Strand and meet the characters from the Easter Story.